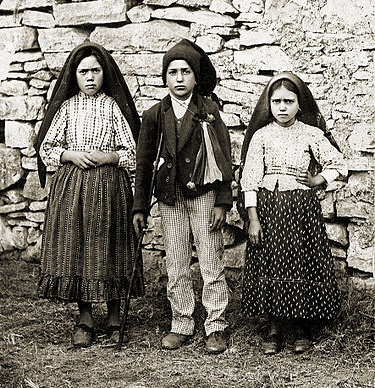 The Blessed Virgin Mary, appeared 6 times to 3 shepherd children; Lucia, Francisco, and Jacinta; between May 13 and October 13, 1917 in Fatima, Portugal. She told children that wars are a punishment for sin; that God would punish the world for its sins in by means of war, hunger, persecution of the Church and persecution of the Holy Father, the Pope, unless we listened to and obeyed the command of God. "Our Lady showed us a great sea of fire which seemed to be under the earth. Plunged in this fire were demons and souls in human form, like transparent burning embers, all blackened or burnished bronze, floating about in the conflagration, now raised into the air by the flames that issued from within themselves together with great clouds of smoke, now falling back on every side like sparks in a huge fire, without weight or equilibrium, and amid shrieks and groans of pain and despair, which horrified us and made us tremble with fear. The demons could be distinguished by their terrifying and repulsive likeness to frightful and unknown animals, all black and transparent. This vision lasted but an instant. How can we ever be grateful enough to our kind heavenly Mother, who had already prepared us by promising, in the first Apparition, to take us to heaven. Otherwise, I think we would have died of fear and terror. "I have seen hell where the souls of poor sinners go. To save them, God wishes to establish in the world devotion to my Immaculate Heart. If what I say to you is done, many souls will be saved and there will be peace. The war is going to end: but if people do not cease offending God, a worse one will break out during the Pontificate of Pius XI. When you see a night illuminated by an unknown light, know that this is the great sign given you by God that he is about to punish the world for its crimes, by means of war, famine, and persecutions of the Church and of the Holy Father. To prevent this, I shall come to ask for the consecration of Russia to my Immaculate Heart, and the Communion of reparation on the First Saturdays. If my requests are heeded, Russia will be converted, and there will be peace; if not, she will spread her errors throughout the world, causing wars and persecutions of the Church. The good will be martyred; the Holy Father will have much to suffer; various nations will be annihilated. In the end, my Immaculate Heart will triumph. The Holy Father will consecrate Russia to me, and she shall be converted, and a period of peace will be granted to the world." Pope John Paul II again consecrated the entire world to the Virgin Mary in 1984, without explicitly mentioning Russia. Some believe that Sister Lúcia verified that this ceremony fulfilled the requests of the Virgin Mary. However, in the Blue Army's Spanish magazine, Sol de Fátima, in the September 1985 issue, Sister Lúcia said that the ceremony did not fulfill the Virgin Mary's request, as there was no specific mention of Russia, and "many bishops attached no importance to it. According to the interpretation of the 'little shepherds,' which was also recently confirmed by Sister Lucia, the 'bishop clothed in white' who prays for all the faithful is the Pope. As he makes his way with great effort towards the Cross amid the corpses of those who were martyred (bishops, priests, men and women religious and many lay persons), he too falls to the ground, apparently dead, under a burst of gunfire. The Vatican withheld the Third Secret until 26 June 2000 and approved Communist atheistic religion "Theory of Evolution", despite Lúcia's declaration that it could be released to the public after 1960. Some sources claim that the four-page, handwritten text of the Third Secret released by the Vatican in the year 2000 is not the real secret, or at least not the full secret. 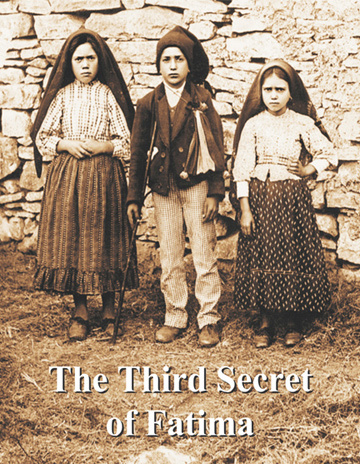 The Vatican has maintained its position that the full text of the Third Secret was published in June 2000. Some Catholic sources claim that real Sr. Lucia died or was killed around 1959 and that was replaced by the Imposter Sister Lucy, because photos and statements of original Sr. Lucia do not match photos of new Sister Lucy who died on February 13, 2005. Question: Full Text of the Third Secret of Fatima not revealed? In a 1980 interview for the German magazine Stimme des Glaubens published in October 1981, John Paul II was asked explicitly to speak about the third secret. He said: "Because of the seriousness of its contents, in order not to encourage the world wide power of Communism to carry out certain coups, my predecessors in the chair of Peter have diplomatically preferred to withhold its publication. On the other hand, it should be sufficient for all Christians to know this much: if there is a message in which it is said that the oceans will flood entire sections of the earth; that, from one moment to the other, millions of people will perish... there is no longer any point in really wanting to publish this secret message. Many want to know merely out of curiosity, or because of their taste for sensationalism, but they forget that 'to know' implies for them a responsibility. It is dangerous to want to satisfy one's curiosity only, if one is convinced that we can do nothing against a catastrophe that has been predicted." He held up his rosary and stated "Here is the remedy against this evil. Pray, pray and ask for nothing else. Put everything in the hands of the Mother of God." Asked what would happen in the Church, he said: "We must be prepared to undergo great trials in the not-too-distant future; trials that will require us to be ready to give up even our lives, and a total gift of self to Christ and for Christ. Through your prayers and mine, it is possible to alleviate this tribulation, but it is no longer possible to avert it, because it is only in this way that the Church can be effectively renewed. How many times, indeed, has the renewal of the Church been effected in blood? This time, again, it will not be otherwise. We must be strong, we must prepare ourselves, we must entrust ourselves to Christ and to His holy Mother, and we must be attentive, very attentive, to the prayer of the Rosary. "Everyone who does not confess that Jesus Christ has come in the flesh is an antichrist [1 John 4:2-3, 2 John 7]; whoever does not confess the testimony of the cross is of the devil; and whoever perverts the sayings of the Lord for his own desires, and says that there is neither resurrection nor judgment, such a one is the firstborn of Satan" (Letter to the Philadelphians 7:1 [A.D. 135]). Prof. Libor Brom From "Where is your America?" Three distinctive periods have marked my life. The first period encompassed my youth before German socialism, or Nazism. The second period covered my young adult life before Soviet socialism, or Communism. The third period of my life began in America. During the first period of my life gigantic demonstrations were prevalent in Europe. Mobs shouted "Peace! Peace! Peace!" The Nazis themselves called for "peace" as they took Europe piece by piece. Democracies began to give in little by little until ultimately they gave up completely. They participated in the Munich peace conference that was to conclude "peace in our time." Munich did relieve, temporarily, many weary minds, and although a people (my people, the Czechs) had been sacrificed, many felt that they had finally arrived at some sort of peace. Churchill protested: "If you do not fight for what is right when you can easily win without bloodshed, if you do not fight when the victory will be easy and not too costly, the moment may come when you will have to fight with all the odds against you and with only a precarious chance of survival.... You may even have to fight when there is no hope of victory, for it is better to perish than to live as slaves. This call for a fight brought cries of "plutocrat, " "warmonger ... .. imperialist," "mass murderer," and "enemy of the people" from many Europeans. Two years later when the German socialists and the Soviet socialists had invaded the independent Republic of Poland and the Western powers had found it necessary to defend themselves, Churchill was called to lead the flight for ultimate survival." During the second part of my life, before Communism, Europe experienced mass movements and demonstrations once more, all in the name of peace and justice. Czechoslovakia, my country, believed in her historical mission. Her people proudly proclaimed themselves to be the bridge linking the Western democracies with Eastern totalitarianism, capitalism with Communism. Czechoslovaks did their best to prove their good intentions to the Marxist-Leninists. But in their approach to the Marxist-Leninist aggressor, the Czechoslovaks made a crucial mistake. They forgave and forgot what the Marxist-Leninists had done to millions of their own people in the Soviet Union and to the other peoples of the world. We must be reminded that to forgive is divine, but to forget is idiotic. 1. Internationally: The agonizing atmosphere of "Munich," which rejects the responsibilities of collective security and maintains the conception that democracies can save their existence by appeasing the power appetite of totalitarian aggressors. 2. Nationally: The delusive thinking of conscience-stricken democratic leaders who believe that constant concessions to aggressive minority groups manipulating nationality against nationality, class against class, race against race, and threatening with violence and revolution will bring about, in the long run, the desired equilibrium of order and justice in the country. 3. Legislatively: Hasty laws of broad social and economic reforms by old-fashioned politicians that imitate the so-called successful socialist countries, undermine the upper and middle-class backbone of the country, and gradually replace the initiative of a free enterprise system with the bitter impotence of a mushrooming bureaucracy. 4. Administratively: The creation of a deceptive coalition (national front) virtually functioning as an instrument of international Communism to brainwash the population, infiltrate public offices, and channel all organs of federal and state power toward a Communist takeover. 5. Judicially: Institutionalized permissiveness with an unchallenged growth of criminality leading to out-right plundering of entire regions and conditioning the public to a feeling of general insecurity and fear. 6. Morally: Common rejection of absolute values such as truth, honesty, decency, patriotism, as outlived and impractical, especially among the youth brought up under the impact of an unprincipled progressive education. 7. Spiritually: General abandonment of the Judeo--Christian belief in a life under God and man's responsibilities as a free moral agent, alternated by seductive demagoguery of materialist humanism and secular collectivism. Many countries in our present world find themselves in the wrecking process that Czechoslovakia went through before February '948. They are headed down the bankrupt road of a one-party political system, to bureaucratic socialism, materialist humanism, and collective cynicism. Since my arrival in the free world, the third period of my life, I have witnessed the same demonstrations for peace and the same impotence-free people challenged by the expanding Marxist-Leninist ideology of arbitrary invasions, expropriations, and deportations. I have witnessed the same fragmentation of originally proud nations into selfish minorities, of helpless minorities into antagonistic classes, of decimated classes into manipulated masses, and of terrorized masses into obedient robots toiling under the yoke of the same totalitarian despots. The largest emigration in history goes on. People continue to flee the existing tyranny, poverty, despair, and fraud in a frantic attempt to save their lives and their human dignity. 1. Secular materialism - the operating assumption that the temporal horizon is all that there is or all that man ever needs to consider - continues to represent a tragic fundamental bias and to permeate every aspect of life. 2. Irrationalism - the concept that the universe does not necessarily make sense - continues to deny man the hope to deal with basic issues. 3. Relativism - the peculiar notion that nothing is good or bad in itself and that everything is either better or worse when compared with some alternative - continues to give reason an excuse to merely discriminate rather than finally decide. 4. Syncretism in philosophy - the decay of speculative thinking which eliminates the search for ultimate truth - continues to synthesize everything, including irreconcilable polarities. As a result of this intellectual environment, individuals are tormented by a confusion of twisted tensions and find themselves overcome by the meaninglessness of life.